The following indexes can be used to search for specific artists or works to see when works were sold at auction and to find out the auction house and date of sale. These indexes cover various periods during the 20th century, some of them continuing to the present. Once an auction sale has been identified, the next step is to use the library online catalog, Scipio, or WorldCat to find the auction catalog itself, usually searching by date of sale. Click the Union Catalogs tab for more information and search tips. Any materials held in Offsite Storage can be recalled for use in the library. Clark staff, students, and scholars may use their circulation barcode to request materials through the online catalog. Researchers who do not have a circulation account should contact the library at least three days prior to a visit to use the material. Kunstpreis Jahrbuch. Munchen: Kunst und Technik, 1980-. Art Sales Index. Phoenix, AZ : LTB Gordonart, Inc, 2010– . Hislop’s Art Sales Index. Surrey, England: Art Sales Index LTD, 2003–2009. Art Sales Index. Edited by Duncan Hislop. Virginia Water, England: Art Sales Index, 1984/85–2002. The Annual Art Sales Index. Weybridge, Surrey: 1969–1983/84. Title for this annual publication varies; most recently the spine title is Hislop’s Art Sales Index. An annual report on the results of public auction sales, mostly in Europe and North America, of paintings, drawings, watercolors, prints, miniatures, and sculpture. Includes annual compilations of record prices, turnover, and works sold for more than £1 million. Covers 450+ auction houses, including many smaller venues. Entries include artist’s name/birth and death dates/nationality, hammer price, title/description of work, dimensions, whether signed and dated, date of auction, auctioneer’s name and place of sale, lot number and whether reproduced in catalogue, low and high estimate, and currency of sale and local price. Use for those years not covered by ArtNet. Le Guidargus de la Peinture du XIXe Siécle a Nos Jours. Paris: Editions de l’Amateur, 1980-. Features well-known artists from selected auction houses. Artist entries include brief biographical and critical information, bibliographic references, and a list of works sold. For each work, information given includes title, dimensions, medium, auction house, sale location and date, price realized in original currency, US $, and French francs. International Auction Records. Enrique Mayer. Paris: Editions Mayer, 1967-1994. MAYER. Lausanne: Ed. Acados, 1995-. Title varies. French edition called Annuaire international des ventes: peinture-sculpture. Current title merged with Livre international des ventes. Sales results of auction houses around the world, with 800+ auction houses from 40 countries; this breadth includes lower and middle markets as well as major houses and is more international than other similar resources. Works are arranged by category (prints, drawings, watercolors, paintings, sculpture, and photographs) and then alphabetically by artist’s name. Entries include artist’s name/dates/nationality, title of work, description of medium/watermark/edition/special editions, dimensions, catalogue raissonee reference, auction house, sale location and date, auctioneer, and sale price in local currency as well as Pounds, Euros, and US Dollars. Leonard’s Annual Price Index of Art Auctions. West Newton, MA: Auction Index, 1980-. Covers paintings, drawings, and sculpture sold at the major auctions houses in the U.S. Works are listed by artist’s name. Entries include artist’s name/dates//nationality, title, whether signed, date, dimensions, medium, provenance, exhibition history, auction house, sale date, lot #, whether illustrated in catalog. Volumes begin with highs from specific auction houses, and a list of auction houses and sale dates cited. Leonard’s Annual Price Index of Prints, Posters and Photographs. Newton, MA: Auction Index, 1992-. A listing of prices realized at auctions worldwide for posters and photographs, major and minor sales. Includes selected bibliographies of reference works on photography and posters, and a bibliography of photographers’ monographs. Organized alphabetically by artist. Includes citations for books and journals where photographs have appeared, when this information is available. Entries include artist’s name/dates/nationality, title, catalogue raisonne, year printed, condition of work, whether cited in reference source, cited former owner, auction house, date of sale, lot number, illustration, dimensions, media and type of paper, price realized. Print Prices Current. London: F.L. and E.L. Wilder, 1918-1939. Subtitle varies. Early volumes document sales at the five principal houses (Christie’s, Glendinning, Hodgson, Puttick & Simpson, Sotheby’s); later volumes add more auction houses. Starting in 1930, American prices are included. Entries include author’s name, title of work, edition, price realized, auction house and sale date. Checklist of paintings, watercolors, gouaches, pastels and drawings, and beginning with 1996/97 modern sculpture, sold at auction for the year. Listed in alphabetical order by author’s name. List of the recorded auction houses begins each volume. Entries include artist’s name/dates/nationality, title of work, dimensions, medium, provenance, literature, exhibition history, whether signed, whether reproduced in the auction catalog and if so a page #, auction house, sale location and date, estimate, and price realized in US$. 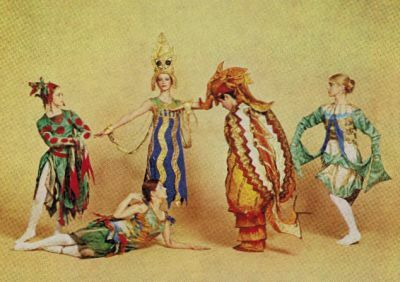 Catalogue of Costumes and Curtains from Diaghileve and de Basil Ballets. Sotheby's, London. Date of sale: July 17, 1968. Lot #51, Costume for a Squid, designed by Natalia Gontcharova for "Sadko," performed in 1916 with music by Rimsky-Korsakov and choreography by Adolph Bolm. According to the price list the squid costume was purchased for $120.